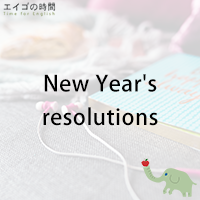 Now, if you’ve been with us for some time, you know we always start the year by talking about new year’s resolutions. A new year’s resolution is a promise to yourself to make a positive change in your life from the start of the year. It’s a goal, not a wish, so it has to be something you would strive for. For example, lose weight, eat better, quit smoking, learn something new, or even spend less time on social media. So, have you made any new year’s resolutions? If you haven’t yet, you may want to make one in English. I’ll give you some more ideas about new year’s resolutions on our website. So, make sure to come visit us on Thursday. In the meantime, why don’t you try a quiz? I’ll give you three sentences. Please listen carefully and choose the one that is TRUE. Ready? 1. A new year’s resolution is a wish list for the new year. 2. Losing weight cannot be a new year’s resolution. 3. A new year’s resolution should be something you would strive for.